This Made in the USA state map platter celebrates your state in an equally charming and useful way—the perfect balance, in our books. Maker Anne Klein’s original artwork highlights what’s special about each state, like its official bird and flag, and its notable landmarks. The just-right medium-sized platter is made from ThermoSāf® polymer, which is microwave-safe, BPA-, and melamine-free. Dimensions: 10" x 14" x 1"
I bought this for our cabin in Maine and love it! We use it all the time. Purchased this as a holiday gift for my brother, who has relocated from Rhode Island to Arizona. When I opened the package and saw the platter, I was so pleased with it, that I gave it to him the very next day. He was thrilled to receive it and had fun finding all of his favorite places, and interesting facts. Light weight, excellent quality. Bought the Ohio plate. From sea to shining sea and every spot in between, the Made in the USA goods from Fish Kiss® celebrate each state in the union with original artwork. 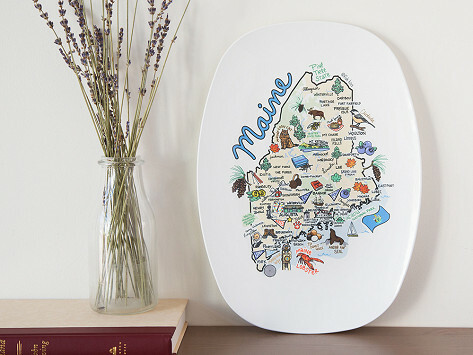 Their state map plates, platters, and prints capture a state’s highlights in charming illustrations. 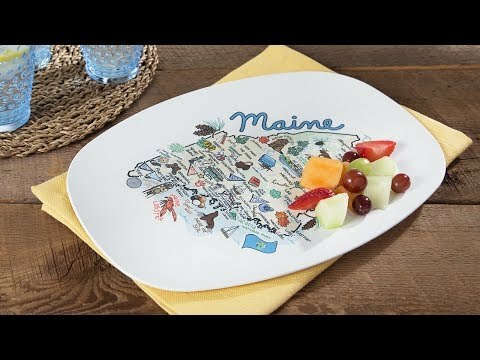 Maker Anne Klein creates the state-centric scenes on art prints, and on platters and dishes made with ThermoSāf® polymer. This durable material is microwave-safe and BPA- and melamine-free. Her whimsical illustrations have a quirky, retro vibe that sweetly capture a state’s highlights, like its birds and flag, or tourist attractions and historical landmarks. Anne worked as a designer before turning her focus to capturing the people and places she loves—like her native Colorado (aka "The Centennial State"), where the prints are made—to every great state across the country.